What is a color guard? On April 14, 2004, much of the following article was published on DCI.org as a special midweek "Fanfare." It was written while I was in San Diego for the 2004 Winter Guard International World Championships. I was asked to do another such column for this year's WGI Worlds and got to thinking that instead of investing a whole lot of time into coming up with something totally fresh, I should just spend less time updating and adding to the column from two years ago. After all, it wasn't run in the regular "Fanfare" spot and many readers today weren't yet reading DCI.org two years ago, plus I just plain feel like getting away with it. By the time you read this, I'll be in Dayton, Ohio for the 2006 Winter Guard International World Championships, something I've been fortunate enough to be at every year since the organization was founded in 1978. When I discovered drum corps, guards were not yet auxiliaries. The year was 1975. 27th Lancers shocked the activity by putting a flag on the end of each pole. This was major, major innovation for the day. Some years later, the same guard would lie on their backs and twirl rifles. It was as if mathematicians had discovered a whole new planar dimension. 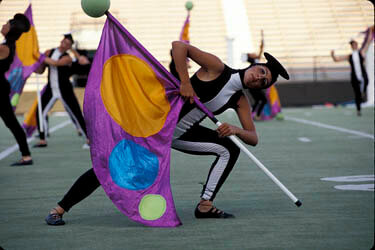 The Santa Clara Vanguard color guard from the days of yore. These things may sound simple today, but consider how Lindbergh's Spirit of St. Louis must have seemed in its day compared to now. (Topicality alert: This article was originally written for the 2004 WGI World Championships in San Diego. The San Diego International Airport used to be known as Lindbergh Field, and there's a replica of the Spirit of St. Louis hanging in the terminal. However, Dayton is even more known for aviation, as it's where the Wright Brothers grew up and opened their bike shop, where many of the parts for the first plane were made. The massive Air Force Museum is worth a definite visit if you're in the area.) Dancing just wasn't done. Well, some guards showed hints of it, but the act had more in common with suffering a seizure than actual dance, as marchers were still "marching" and hadn't yet been taught how to be graceful yet. "Gracefulness" had yet to be entered into the lexicon of the abridged drum corps dictionary. It was hard to be graceful toting a 16-pound rifle and wearing a military-inspired uniform. (In 1976, the corps I marched with, the Cavaliers, had their rifle bearers pivot around their rifles that were sticking up from the ground like one of those miniature ponies walking around a tether at kiddie birthday parties in the back yards of affluent suburban hosts. We thought THAT was dance. Grace was something we said before eating the corps breakfast of donuts off the truck in hopes it would prevent our arteries from clogging before we got to the practice field.) Instructors who had been exposed to modern dance decided their guard members were capable of learning how to dance, and so the activity probably experienced its most major evolutionary change when members learned that moving their feet involved a whole lot more than marking time. In 1976, Bridgemen came out on the field in the wacky trench coats and hats with psychedelic headbands. The guard had flags that resembled a take on the Bayonne Bridge, as drawn by a spastic four-year-old with a premature caffeine addiction. When the guard jumped on top of their flagpoles and pretended they were horses during the brief "William Tell" fanfare near the end of the show, the activity was scandalized. Some traditionalists proclaimed, "Why, they're having fun! That can't be allowed!" 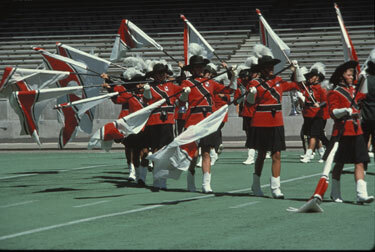 In 1978, Santa Clara Vanguard's guard ditched rifles entirely in favor of bedsticks. More sacrilege. But the corps was good enough to win, so the guard activity opened up some more. If your corps was a champion or close to being one, it was easier to "sell" your idea to the Simon Cowells of the drum corps world. Shortly thereafter, Freelancers' guard came out in form-fitting red and white body stockings that detractors said resembled a Coca-Cola bottle. The corps was not a finalist, and so it might have been a more difficult "sell" to the public. Guards had always been in either uniforms resembling the corps proper uniforms, or other uniforms that complemented the corps proper. The idea of costumes was still alien. Freelancers perhaps took a hit for the stark minimalism of the costumes, but a couple years later, sleek body stockings were rampant in guardom and few thought anything of them. The 1994 Marauders color guard decked out in stretch fabric costumes. Sometimes, being ahead of the game is as treacherous as being behind it; something discovered by Star of Indiana's guard in 1993 when they brought stark long poles and things resembling construction trusses onto the field. Over time, guards took on more an individual identity than before. We had Blue Devils, who were sleek and sultry, Santa Clara Vanguard, who were elegant and sophisticated, Phantom Regiment, whose persona was one of eating nails for breakfast, Madison Scouts and their "Magnificent Men" who twirled rifles like whirling dervishes, 27th Lancers, whose guard was more a visual focal point than perhaps any other guards, and Bridgemen, who had a great traditional guard beneath a veneer of Broadway pageantry. But there were many other notable guard memories from the late 1970s and early 1980s as well. North Star made people laugh with gigantic lips in 1978's "Sir Duke," one of the most blatant earlier uses of props. Cavaliers started taking on a more athletic approach, which was manifested in the winter guard's three consecutive World Championships in 1981 through 1983, at the same time that Phantom Regiment's guard was telling a story on the field through interpreting the tale of "Spartacus." Now guards could tell a story as well as twirl and spin...a natural evolution and more logical for guards to do than, say, bass drums. Keep in mind that prior to the formation of DCI, flags didn't spin...the flag bearers just marched around the field with the poles vertical. Now guards were as much storytellers as Will Rogers. The evolution was more revolution than anything else. It's probably hard for some to realize that guards were once considered just frosting on the field, but it's probably hard for newcomers to understand how we went so many decades without a guard caption that actually counted towards the score, until quite recently. (The guard score didn't really mean much, other than count towards a trophy. Sort of like that whole popular vote/electoral college debate.) So now we argue whether guards are guards or auxiliaries. It's hard to imagine the Cadets doing their latest incarnation of "West Side Story" (1994) with a traditional guard as opposed to a character-developing auxiliary, as also Blue Devils capturing the mood of gangsters (1996) or Casablanca (1997) without becoming part of the storyline. 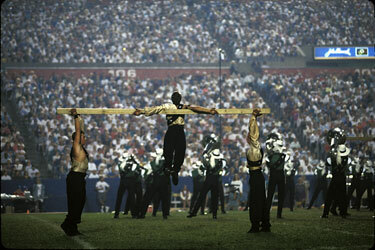 The 1994 Cavaliers color guard utilized wooden posts in their work to portray dark and masculine characters. Are they to just enhance or should they create a show of their own? Do auxiliaries have to spin and twirl as much as pure guards? What about the role of costuming? Is it easier to train a dancer to use equipment or guard folk to dance? Is a guard that doesn't dance much expending as much energy as one that does? Is dance so prevalent that we shouldn't even use the word "dance" in our vocabularies any more? These are just a small handful of arguments to which we'll likely never find the answer or at least agree upon. Times change, corps change, guards change. We've come so full circle that when the Cadets' guard jitterbugged in "Boogie Woogie Bugle Boy" (2002), the decades-old dance was downright revolutionary on the field. A guard that employs double flags doesn't raise eyebrows anymore. Neither does a guard who utilizes jazz dance training, or wears body stockings, or is coed. We've almost lost our ability to be shocked and amazed because the quality of performance is so high throughout the activity. But we do watch the guards more than we did in the past, because there is so much more worth watching throughout the shows. And guard members have to be in Olympian-caliber shape to perform today's shows without having their hearts pop through their chests like some special effect in an "Alien" movie. We rely on guards more to convey the story, whether they're utilizing cots, ladders, umbrellas, group hugs, gang jackets or Catholic schoolgirl uniforms. A guard member could just as easily disappear into a character as an altered dimension, or a guard (or auxiliary) member could just be a guard member in the traditional sense, whatever traditional means anymore. In 2005, these infamous characters from the Cadets worked in conjunction with and as a seperatre entity of the corps' main color guard during the show. I hope we are still in our infancy in terms of what we've seen that guards can do. The bar seems to be raised a little more every year in demand and polish. Guard members are hard working contributors to the field productions...we can't imagine the shows without them. The Spirit of St. Louis has become a space shuttle. Where guards (or auxiliaries or whatever we'll call them next) take us next is only limited by the parameters of imagination.